Sarah and Alan traveled all the way from London to come to Central Florida to get married. The couple had vacationed here many times in the past and Alan’s son lives stateside, so they knew the perfect location for their destination wedding. 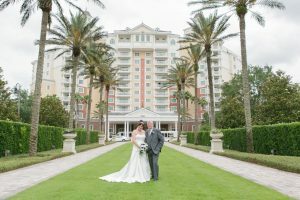 Reunion Resort, with it’s beautiful landscaping, architecture, and dinning was the perfect place to stay and have their intimate wedding ceremony. Blush by Brandee Gaar coordinated the event from start to finish. They recommended fantastic vendors, set up decor, and made sure everything and everyone were ready to go. Cheryl’s Destinctive Creations lined the aisles with rose petals and created the amazing bouquets and boutonnieres for the bridal party. Married by Mail assisted the couple in obtaining their marriage license long before they every arrived in Florida. The couple went on the marriedbymail.com website, filled out the information, and the marriage license was delivered to their officiant. Alan said “As you know we have been together for nearly 20 years and I love her now more than ever. I do remember telling my mum the first time we went out that I had found my wife. She keeps me grounded and calm as I have a very stressful job running both my companies in UK and USA. She has brought our boys up to be lovely lads and always has time to help others before herself. I still love being around her and can’t wait to board my next flight home from wherever I am in the world. Alan and Sarah chose to walk the aisle to music inspire by their love for Disney.